1) Remember that room which has been a sore point with her for quite a while? Or might it be the entire house, inside and out? Afford yourself the luxury to dream with her about what the new colour will look like; this will be your last dream for some time. Do your calculations, then decide it’s too expensive to get a contractor and go buy paint and brushes. No, you cannot come home with a crate of beer in the boot! 2) As soon as you have finished the paint job, you can fix the fence and chop up the cracked cement in the driveway and do it over – preferably in the hot sun so that at the same time you get a free sauna and afterwards everyone will think you had a holiday at the coast. Result: You have burnt 195 calories per hour (cph), strengthened your stomach, core and rotating muscles. 3) Now you are outside; rake the leaves together, dig over the plant beds, ask the wife what seeds or plants you can sow or plant for her. Dig over the compost heap. Spray for weeds and insects. It is psychologically healthy to make contact with mother earth. Prune plants and remove dead branches. The pots need new soil and might have to be shifted and the bird bath has to be scrubbed. You may now drink some cold water – as much as you like before tackling the next task. Result: You have burnt 289 calories per minute (cpm), strengthened your stomach muscles and put in a few squatting and stretching exercises. 4) That garage … Sort what has to go to auction and what may stay. Carry everything outside, wipe the walls, shelves, cupboards and window sill and get rid of the oil spots on the floor. Check your car’s tires, oil and water. Result: You have burnt 195 kph, and weight-lifting benefits your biceps and thigh muscles and builds flexibility. 5) Wash two days’ dishes. After all the hard work during which you sometimes had to use brute force, it is necessary to do fine motor exercises, and once again come into contact with your female side. Remember to tidy the kitchen and wash the floor. While doing the dishes, switch on the washing machine and hang out the washing to dry when the cycle is complete. Perhaps now might be the right time to surprise your wife with a dish-washer and yourself with a liquid six-pack and some firewood. The lapa and braai must also still be cleaned. Fortunately you don’t have to make the salad for dinner. Result: Burnt 195cph. 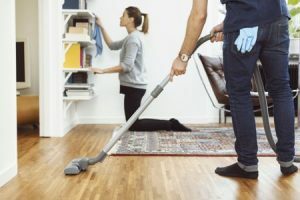 6) Vacuum the house; under the sofa, under the beds, on top, under and behind loose-standing cupboards. Remember to wipe the floor skirtings with a wet cloth, as well as on top of the doors. Bribe the kids to clean the bathrooms. Jump on your bike and go fetch milk. Result: Burnt 190 – 420cph, depending on how fast you were cycling. A great stretching exercise for shoulders, and the squatting exercise strengthens the thigh and stomach muscles. 7) While vacuuming, clean your car on the inside and polish the dashboard. The car will look better once it has been washed and given a layer of protective wax. Remember to clean the vacuum machine’s bag before putting it away. Quickly sweep the back yard. Result: Burnt 230cph, squatting and stretching exercises strengthen the thigh and stomach muscles. 8) Look in the mirror: See how flat your stomach is? Feel good about yourself and everything you have achieved. Maintenance is essential, start at number 5 and repeat three times per week.